The Kidde 9v DC 19HILL Ionisation Smoke Alarm has a sealed in 9v 10 year lithium cell to provide complete peace of mind for your home protection. This ionisation smoke alarm is inter-connectable with up to 11 other compatible kidde units to give complete fire safety coverage in your home. The sealed in lithium cell battery is guaranteed for 10 years and the Kidde smoke alarm is approved to BS 5839 Part 6 2005 : Grade F.
The smoke alarm features a hush button combined with a stylish slim line design. With the sealed in lithium long life battery this is the perfect ionisation smoke alarm to protect your loved ones and your home. Ionisation Smoke detectors are designed to respond faster to flaming. 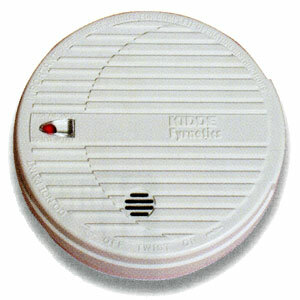 An ionisation smoke alarm is best positioned in hallways, landings & living rooms. Not recommended for bedrooms. An ionisation smoke alarm should not be placed in a kitchen or bathroom.